INDIANAPOLIS, December 21, 2009  In one group of high school students, one is never afraid to try anything, another has raised his grades to honor-level, another is a student leader praised for her leadership abilities, one is said to "relentlessly pursue excellence," and another is well known for her strong musical talents. In a second group, two kids can't hear well enough to listen to group directions or discern many musical notes, one has a life-threatening condition that affects her ability to breathe when exerting herself, another sometimes runs into people because she can't see well, and yet another is known to retreat far into himself and the depths of an autism spectrum disorder. Be honest. If you were a band director, which group would you most want in your marching band? Actually, you couldn't have one without the other, because these two groups of characterizations describe just five marching band students from five 2009 Bands of America Grand National Championship finalist bands. Each student has disabilities. And each, like all people, has abilities. These students represent some of the top marching bands in the country, including the Grand National Champion. Because their directors took a chance on them, they have contributed to their band programs' success, both on the field and in the lives of the students they perform with. They're the perfect examples of Music For All's mission  to create, provide and expand positively life-changing experiences. They are the embodiment of the reality that music really is for ALL. From the age of 2 weeks, Emily Ingram has been diagnosed with cystic fibrosis. Cystic fibrosis is a genetic disease that causes thick, sticky mucus to build up in the lungs and digestive tract. It is one of the most common types of chronic lung disease in children and young adults and is usually fatal in time. "Our goal has always been to keep Emily as healthy as possible while allowing her to lead a normal life," says her mom, Amy Ingram. "Emily is in the top 5 percent of her class academically and has never used CF as an excuse in any area of her life." Still, Emily's eagerness to begin to play oboe in middle school gave her parents pause. "We were afraid she wouldn't be successful at band because of her disease, but we wanted her to have the chance to try," Mrs. Ingram recalls. "Early on, it was obvious how gifted she was in oboe, and our fears were soon gone." 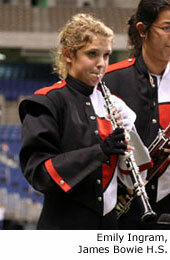 In high school, Emily played oboe in a quartet as part of the Bowie marching band show as a sophomore. But she really wanted to march, and she took up playing the flute so she could have that chance. The thought of Emily playing and marching, and the long hours of band practice in the Texas heat, gave her parents ample reason to hesitate. "Emily spends hours each day doing various treatments to keep her lungs as healthy as possible. She also takes over 25 pills each day. Despite all of her best efforts, she actually had to have her upper right & middle lobes of her lung removed last year because of chronic damage and dead lung tissue," Mrs. Ingram wrote recently. It was after that procedure that Emily told her parents that she wanted to march. 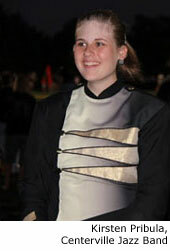 "I wanted to be in marching band because I wanted to fully participate in the craziness that we call band," Emily says. "I knew marching band was a completely different experience than concert band, and I wanted to share in that experience!" Her parents were unsure, but in the end, the Ingrams made an excruciating decision. "We knew that the quantity of years of her life might be affected from the physical exertion, lack of sleep and difficult academic load, but that her quality of life would be much improved because she so wanted to march," says her mom. After much discussion, Emily and her school agreed to her having eighth period off to come home for a breathing treatment before band practice, and band director Bruce Dinkins made it clear that Emily was free to take breaks as needed, and that she needed to be in charge of resting when she needed it. Her entry into the marching band has not been without difficulty. "It's definitely more difficult to play an instrument or march with Cystic Fibrosis," she says. "I have struggled before with not being able to play on the field because I literally couldn't breathe. This summer, I was extremely affected by the heat and felt awful, but I have worked through these challenges slowly. My directors have been extremely accommodating, and my parents have definitely helped me succeed all my life." As James Bowie High School's director of bands, Bruce Dinkins had no reservations about Emily's talent. "She is a very bright and talented young lady. Her contributions were not only meeting the demands of the drill and the music but meeting the demands of her health condition, and she did both," he says. "She has taught me about perseverance, consistency and determination. She is just a model student and person, and she has not allowed her disability to stand in her way." Emily views all the challenges as well worth the effort and even the risk. "The best part about being in band is the feeling you get after an amazing performance. When it's over, you know all that hard work was worth it," she says. "I also love that when I play my oboe or march on the field, I can be virtually normal. No one knows I have Cystic Fibrosis, and I can just be me. It is an incredible feeling to be 'normal,' even if it's just for a few minutes." For Emily's parents, all their doubts were wiped away at Bands of America Grand National Championships. "As she stood on the field as a member of the one of the 12 finalist bands, I knew that we had made the right decision," Mrs. Ingram says. "She was right where she belonged, and as she said on our way back to Texas, 'that was an experience of a lifetime.'" If you watched the Centerville Jazz Band perform its Elvis tribute show at Grand National Finals, you couldn't pick out the pit musician with a hearing impairment. Yet Kirsten Pribula turned in that award-winning performance despite being profoundly deaf. Kirsten was born with a moderate hearing loss and became profoundly deaf at the age of 5. As a young child, she had already broken through one barrier: she was her piano teacher's first deaf student. So by the time she hit middle school, barrier breaking came naturally. Kirsten developed an interest in band as soon as the opportunity arose in middle school, says Jim Pribula, Kirsten's father. Soon, she settled on percussion instruments. The results, says her dad, have involved more than her musical success. "Being part of the band has allowed other students to get to know Kirsten on a more personal level, and it has helped her fit in. In marching band, she had about 200 friends her first day as a freshman." Now in her sophomore year, Kirsten is playing the marimba. Marching band is hard sometimes, she says, but certainly worth the effort. "I have a hard time hearing the notes I'm playing, and when there are directions being given, I have a hard time understanding them," she says. She uses the band's location to know where they are in the show. "I also listen to the drum set behind me  I can feel the vibrations so it keeps me in tempo," she says. "My eyes are also my ears, and I watch the other marimba players so I know what part I'm at." Overcoming such challenges are typical for Kirsten, says her dad. "She has never thought she could not do something, even when others thought it would be impossible," he says. "If you try, you can do anything, even with a hearing impairment," observes Kirsten. "And from getting up early, long practices and hard work, I've learned what it means to be a part of a team. I have learned that everyone depends upon each other." She can't see someone coming from the right. She can't see out of her right eye at all in the sun. Lezli Shelander is legally blind in her right eye, but it hasn't kept her from playing flute in the Marcus High School marching band. "I've gotten used to watching the drum majors and finding my dot with just my left eye. At first it was scary not knowing what the person next to me was doing, but I guess it was good in a way  I don't flinch when others march toward me on the right side!" She may not be able to see well in bright light, but her ability to look on the bright side of all challenges is well known. 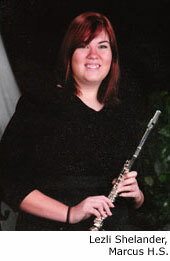 "Lezli's efforts were 'can do' from the outset," says Marcus High School Director of Bands Amanda Drinkwater. "She never considered any option other than participation at the highest level." Lezli's mother, Robin Shelander, says Lezli works around a number of challenges to participate in band. "The size of the music sheets can give her eye strain and headaches," she says. "Placement of the music stand can be challenging, especially if she is sharing music with someone else. One summer a student fell on the asphalt behind Lezli's right shoulder, and Lezli was marching backwards and flipped over the student on the ground and landed on the asphalt on her head, which was scary for a few moments." Lezli compensates for those limitations by memorizing music and drill extremely fast. As a section leader, says Lezli's director, "Lezli has the ultimate support and respect from her section members due to her intrinsic leadership qualities and dedication to the program. I don't think there is one student who views Lezli as having limitations." For Lezli, her marching experience at BOA Grand National Championships went far beyond what can be seen. "Grand Nationals was an experience I'll never forget. There were so many incredible bands," she says. "Standing on the field at retreat with my band was humbling, flattering, and it still makes butterflies fly in my stomach when I think about it." "I was just walking down the hall in school one day and saw a tryout poster with a girl spinning a rifle. I thought dancing with a rifle would be interesting, so I wanted to try out. I never thought I would make it," says Brooke Dixon. That statement could be about nearly any young student hoping to make the color guard. But by all accounts, Brooke Dixon is special. She also happens to be deaf. "Everyone  her doctors, teachers, even strangers  always commented that there was something special about Brooke," says her mom, Angie Dixon. "We've always encouraged her to do whatever she sets her mind to, and she has such a positive attitude and faith in God. She knows that hard work and faith will pay off in the end." 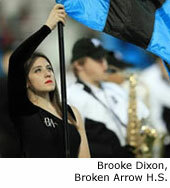 Brooke set her mind on color guard, and she made the team. From there, the most remarkable thing about Brooke has been how unremarkable her journey has been. "Nothing really made me feel challenged, because I had a sign language interpreter to give out the information visually as the coach gives it out verbally, so that's all I need." As for the rest, guard movements are dependent on counts, and Brooke can count as well as anyone else, and she is also a talented dancer. The combination of her determination and talent means she gives a lot to her award-winning band and color guard. "I've learned as long as you set your mind to something, you will succeed, so never say 'I can't,'" Brooke says. "Color guard has made me part of who I am today, bold and strong minded. I really hope that my being involved in color guard with no hearing inspires others, both hearing and deaf people, to step up and reach for their dreams." For a child with an autism spectrum disorder, life is often filled with wanting to fit in, wanting to communicate and even make friends, but finding it extraordinarily hard to do so. For many young people with the disorder, participating in marching band might be on that list of things they wish they could do. But the Grand National Champion Avon High School Marching Black and Gold has a way of turning dreams into reality. Marian McCanless is mother to 15-year-old Cameron (Cam) McCanless, who has Asperger's Syndrome, an autism spectrum disorder. She says most people have no idea what Cam and his parents face each day. "I remember when he was 8 years old having a birthday party at a movie theatre for him and inviting all the boys in his class. We waited and waited, and no one showed up. No one wanted to be at his birthday party. I was devastated. Cam said, 'Mom, I don't have any friends. I don't fit in with anyone. I'm different.'" As someone with Asperger's syndrome, says Ms. McCanless, Cam may not seem different at first. "To meet Cam, you wouldn't immediately know something is wrong. But he doesn't look you in the eyes when he talks. He can't hold a normal conversation, though he's getting better at it," she says. "Cam has had a really lonely life. He hasn't had friends in his own year at school, and he spends much of his day alone." As a real estate agent, Marian came to know Rick and Karen Waggoner, band directors for Avon's intermediate and junior high schools. When she discovered that Rick was the sixth-grade band director, she asked him what instrument Cam might play, and he suggested percussion. Cam began in sixth grade as school started. "We hadn't seen much in the way of progress, but when my parents visited, Cam brought out his xylophone and started playing for them. He just glowed and just kept on playing and playing. He was proud. This was huge for us," she says. 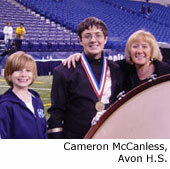 When Cam entered high school, his mother signed him up for marching band despite her fears for her son. "I was nervous. At first it was a lot of work for Cam. Children with autism don't like change, and here he was going to be at a new school and then band, too. I was worried." Cam made it through band practice every day. When it came time for band camp, however, he pleaded with his mother to let him stay home. Fighting her own fears, she put him on the bus to band camp. "When the buses came back and I picked up Cam, he got in the car and started telling me all about band camp and did not stop talking! This is unlike him," says Ms. McCanless. "Normally I have to work really hard to get him to talk about anything at all. I was so delighted - he had fun!" Ms. McCanless says she had no idea what benefits participating in band would bring to her son. "Cam has just blossomed. His grades have always been C's and D's, and now all of a sudden he's getting A's and B's," she says. "And he's not quiet anymore  now he talks a lot and engages in conversation. Now he has something to talk about and he does! I noticed when I went on a field trip with the band that he has friends. He smiles. He laughs. Before band, he was shy, withdrawn, and he never smiled. Now he's happy. He's confident. He's truly proud of his band's achievements  of his achievements." Cam's confidence shows in his comments about his band experiences. "Music comes naturally to me, and playing has been easy," he says. "I am proud to be with the Avon Marching Black and Gold. I have enjoyed the performances, the competitions, and seeing my mom and dad and family and friends so proud of me." Cam thanks Mr. Ramirez and Barbara Doll for helping him with playing the marimba and keeping him organized. "Hard work and effort have made me more responsible," he says. "My grades have gotten way better. I am happy. I have something to talk about now. I am proud of what I've done and how we've succeeded." Those words alone are music to Cam's family's ears. "I know how wonderful the band's achievements are for everyone who contributes to the Avon Marching Black and Gold, but as much as those accomplishments are absolutely wonderful, the real miracle here is what they did for Cam and me and our family," says his mom. "What that band has done is priceless. I could never thank them enough." Beth DeHoff is the community relations manager at Music for All, one of the largest and most influential national music education organizations in support of active music-making. Music for All presents more than 20 music education events nationwide annually, including the Bands of America Grand National Championships, Music for All National Festival and Music for All Summer Symposium. Music for All's research and advocacy efforts work to ensure music education is available to all. Learn more at www.musicforall.org. See more information about the Bands of America Grand National Championships and see 2009 Grand National Championships Semi-Finals Photos on Marching.com. Text and photos courtesy of Music For All.